Broken Blood Vessels On Face actually has no health risk. But many people feel not confident with his appearance. Damage to blood vessels in face shows a red color like a spot on the face. 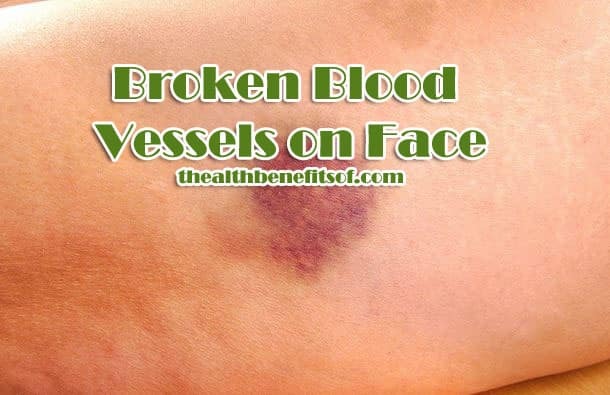 This situation occurs when the blood vessels beneath the skin are damaged and widened. Damage to blood vessels on face usually caused by genetic problems in hereditary. However, there are also that occur due to several factors such as due to extreme weather, UV exposure, rosacea, or spots on the face due to drinking lots of alcohol. Even in certain cases, vomiting and sneezing can also cause damaged blood vessels. If you experience a broken capillary vessel, you can cope with some powerful home remedies, but this depends on the cause of the damage to the blood vessels. Some home remedies can fade red spots on the cheeks and shrink the vessel damage, and reduce the red spreading on your face. In this article we will learn about the causes of the appearance of spots on the face and damage to the blood vessels in the skin. Then, we will also see what can be done to treat and eliminate the appearance of red on the cheek, eyes, chin or in your nose. Knowing the cause of damaged blood vessels is very important, because it is helps the treatment process later. So can also make a person more careful about the cause so it can be avoided from the beginning. One of the causes of ruptured blood vessels in face is a hereditary or genetic factor. Dr. Carol DerSarkissian in the WebMD page asserts that genetics can affect a person’s veins, so that sometimes it appears like a red spider or like a red thread under the skin. Furthermore, the blood vessels on your face are also influenced by extreme weather either cold or hot weather. Due to the weather it sometimes causes the appearance of red veins facial skin like a spider web. Thus, hot and cold temperatures affect the blood flow and have an effect on your facial skin. When summer or winter comes, you should cover your face with a cloth cover to prevent exposure to extreme weather. In addition, avoid washing your face with too cold water or with too hot water, for some people it is can trigger damage to blood vessels. Exposure to too long under UV light can also lead to rupture of capillaries in face, said by The American Skin Association. Research reveals that sunlight can cause damage to the vessels in the face so that the red appears widened. In addition to the face, this condition can also occur in the nose, chin or in eye area. Alcohol is one of the causes of broken blood vessels on face. It is happens to those who drink alcohol on a roll. According to Dr Susan Simpkin that drinking alcohol too often may causes brain damage and unable to regulate the vascular. As a result, your face looks red continuously. Further Dr. Susan says that drinking alcohol also causes damage to the liver. These heart-wreaks cause the appearance of spider veins on your face, chest, neck, and around the abdomen. This is a chronic skin problem that causes blood vessels in the face area enlarge and widen so that your face looks red. This red color appears due to capillary damage under the skin. According to Dr. Maria Marzella rosacea is the cause of the deterioration of capillaries in a person’s face, she says on the WebMD page. Vomiting and sneezing also cause the occurrence of broken blood vessels in your face. In fact, sneezing and vomiting can cause it suddenly. Comments Dr. Rod Moser says that sneezing can destroy blood vessels around the eye, this is called subconjunctival bleeding. As mentioned above, among the protection that must be done to avoid the blood vessel damage is SPF sunscreen, skin care and use a large cap that can keep the face exposed directly with UV. If you are experiencing the problem of damaged capillaries in the face of course need to get treatment to keep your appearance beautiful. Here are some natural remedies that you can try directly at home. Vitamin C and lysine amino acid is one of the drugs that can disguise the appearance on your face. This vitamin is useful for maintaining healthy skin including strengthening blood vessels. Several studies have revealed that combination of vitamins and lysine is powerful to boost the cardiovascular system. Based on research, vitamin C is instrumental in the health of blood vessels by flow the blood. Smooth blood flow can minimize capillary rupture. In addition, vitamin C also provides a good level of elasticity in the blood vessels. Other studies reveal that lysine is useful to prevent weak blood vessels. Health experts recommend that we consume plenty of vitamin C so that the blood vessels are always in a strong state. Witch hazel contains strong astringent which is useful to disguise broken blood vessels. Using Witch hazel will make the blood vessels widened and broken into small. In addition, in Witch hazel also contains tannins that support to shrink the pores. Apple cider vinegar used on face will reduce effects of rupture of blood vessels by shrinking the appearance of blood vessels under skin. The use of apple cider does not bring any side effects, for maximum results you should use it for at least 3 months. Caution: Using apple cider vinegar on face should be done with caution. Facial skin is very sensitive and can irritate. So, dilute it with water, using a 50:50 ratio. Then apply it to the face.